Teaching Technical Skills for Surgery – How Can We Improve? Teaching technical skills is an obligation of all surgical trainers. It is vital that technical skills’ teaching is performed appropriately and effectively. However, it is not certain which methods are most effective for skills teaching, as it is difficult to objectively assess the quality. 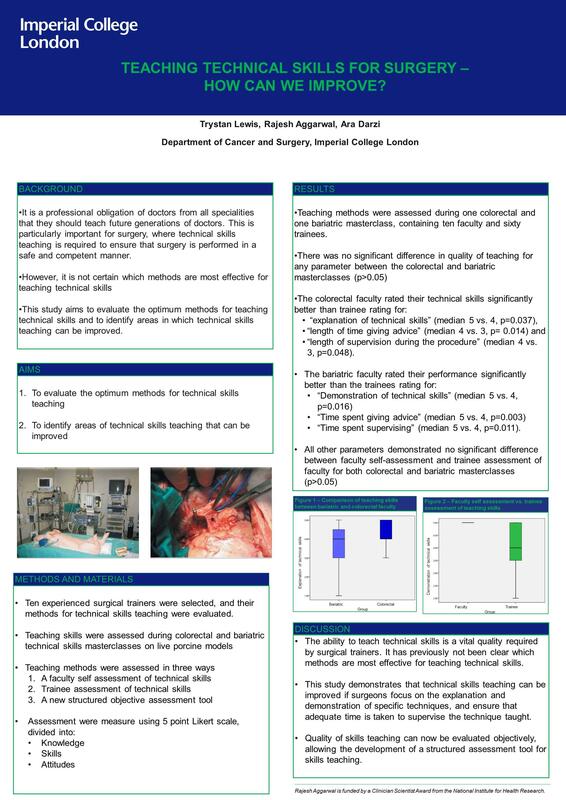 This study aims to evaluate the optimum methods for technical skills teaching, and develop a new assessment tool that allows objective assessment of teaching methods by surgical trainers. The technical skills teaching methods of ten experienced surgical trainers were evaluated during a bariatric and a colorectal surgical masterclass using live porcine models. Teaching methods were assessed in three ways; by faculty self-assessment questionnaires, trainee assessment of faculty questionnaires and a new structured assessment tool developed to objectively assess the quality of teaching skills during practical sessions. Assessments were divided into knowledge, skill and attitude parameters and measured using a five point Likert scale. Teaching methods were assessed during one colorectal and one bariatric masterclass. Each masterclass contained five faculty members and thirty trainees. There were no significant differences in quality of teaching for any parameter between the colorectal and bariatric faculty (p>0.05). The ability to teach technical skills is a vital quality required by surgical trainers. It has previously not been clear which methods are most effective for teaching technical skills. This study demonstrates areas of technical skills teaching that could be improved. Quality of skills teaching can now be evaluated objectively, following the development of a new structured assessment tool for skills teaching.